I didn't know a lot about Paw Patrol until my 3 year-old niece introduced me to the show. An animated series about a group of six rescue dogs, Paw Patrol is her favorite. I'll have to admit, I can see the charm. This holiday season, there is a lot of Paw Patrol merchandise on the shelves. 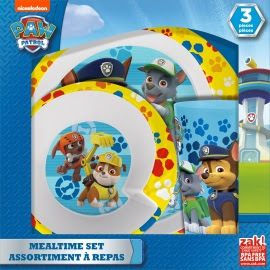 One that would make a perfect gift for fans of the show is the Paw Patrol 3-piece Kids Dinnerware Set. This dishwasher safe set includes a plate, bowl and tumbler with healthy eating and exercise tips on the back of the box. Each piece features several characters from the show. The plate and bowl are made of melamine. None of the three are microwave safe. The bowl, tumbler, and plate are just the right size for younger children. My niece, MaKynzee, has already claimed this set as hers and declares to use it anytime she comes over. Do your children watch Paw Patrol? My 3 year old son is a Paw Patrol Fanatic! His favorite is Marshall. I know a little boy that loves Paw Patrol!